There is one activity that combines all of these methods, and that activity is camping. By "camping", I don't mean day trips, or visits to non-wilderness areas. I am talking about staying in the woods for at least a day and a night (preferably more). Camping works so well because it gives scouts lots of responsibility. The responsibility comes from needing to stay warm and dry and safe and not hungry. This is not trivial, and it requires a great deal of teamwork and individual fortitude to accomplish. Camping is where nearly all personal growth takes place in scouting. The outdoors presents a myriad of obstacles--some small, some large. And each of these challenges boosts the confidence of the scout who overcomes them--and tests the resolve of the scout who fails. "Personal Growth" is nothing more than the combined effect of multiple successes and failures. Without camping, a patrol has little to bind it together. Often, groups of scouts will be split between the most charismatic boys and the least. There is no criteria for leadership other than personal charm. Camping changes this by providing tasks for the group to accomplish. The successful leader becomes the scout most willing to work for the group. Leadership often begins with the boy who sees the rain coming and yells at his buddies to help him put up a tarp. 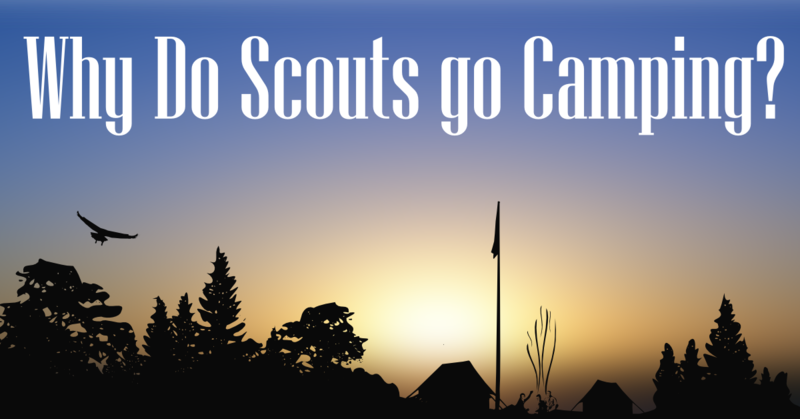 Camping also gives scouts the opportunity to take control of their lives. The scouts decide what to do on a campout. Do we want to go swimming? Do we want to build fires? Do we want to play games? Do we want to launch rockets? Should we shoot arrows or slingshots? Should we build a catapult or a diving tower? Should we film a movie? Should we go fishing? Should we camp in this site or the next one? Should we come back to this place next month? This freedom to choose creates a tremendous opportunity for scout leadership, and keeps a troop energized and active. Camping is the proving ground for the ideals of scouting. Each point of the scout law is transformed from an abstract idea to a specific set of actions. We are trustworthy--we put the money in the drop-box for the park fee. We do the dishes when it's our turn. We are loyal--we stick with our patrol, even when lost. We develop a bond with those whose company we share. We are helpful--on a campout, there is never a shortage of things to help with. We are friendly--when we live with others for days at a time, being enemies is not an option. We learn that the best way to eliminate an enemy is to change him to a friend. We are courteous--we are respectful to each other, because we have to cooperate. We leave dry firewood for the next campers, because some courteous person left it for us once. We are kind--Although we could, we don't kill animals without reason. We learn the value of life by observing and living alongside thousands of plants and animals. We are obedient--In an environment where we use knives and fire on a regular basis, swim in deep water and confront bears, we learn a thing or two about obeying rules. We learn the risk of bending rules just because of convenience. We are cheerful--Even when it's raining. Because on campouts we get rained on...a lot! We are thrifty--We don't use up all our matches on the first fire. We plan our menus so we can eat well and afford it. We are brave--When the bear comes, when the night is completely dark, when we accidentally slice our finger with a knife, when the temperature dips below zero, we get plenty of bravery practice. We are clean--We keep the forest clean, and try to leave it undisturbed. We come to realize the difference between a pristine wilderness and a forest that humans have abused. We are reverent--When camping, we witness constant miracles of nature. We are exposed to the beauty and complexity of our universe, and we have time to contemplate its meaning. Without camping, scoutmasters and other troop adults would be hardly different from schoolteachers. Of course, teachers are fine role models, but not to the degree that scouting requires. On a campout, adults provide a constant example of cooperation and resourcefulness. Naturally, the adults don't do any of scouts' jobs for them, but they demonstrate by example how those jobs should be done. There are many alternatives to the standard troop/patrol campout. Scouts sometimes take day trips, hikes, bike trips, or visits to museums, airports or any other interesting location. Also, there are occasional large events--camporees or jamborees--attended by many troops at once. These can be successful or not, depending on how closely they adhere to the methods of scouting described above. Do scouts camp in patrols? Do they plan and execute their own activities? Do the scouts set their own schedule, with regard to activities, games and free time? Do they plan and carry out their own activities, or do they follow a rigid program determined by someone else? A quality troop will have 12 campouts each year--one a month. Achieving this goal takes plenty of work from scouts and adults both. It can be tempting to count other events, such as the ones described above, as substitutes for camping. Tempting, but ultimately damaging. It is the number of full-on camping trips that distinguishes a good troop from a great one. Likewise, scouting is one of many good organizations for young people. But camping is what makes scouting great.